Let me translate. "Residents you are stupid if you don't like our bike lanes. Obviously you just don't understand how to use them and we need to educate you." The City apparently is not interested in residents' feedback on the bike lanes or input on how to design the bike lanes better for motorist and bicyclist alike. Curbs frame the bike lanes cutting off a bicyclists' escape from a car drifting into the bike lanes. The bike lanes have debris or standing water in them. The bike lanes run by parked cars which leads to "dooring"
Traffic lanes are significantly narrowed or eliminated to produce the bike lanes. 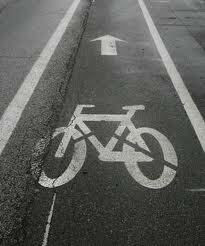 The bicycle lanes on Broad Ripple are irresponsible. They took an entire lane of car travel to make a silly bike lane and curbing, ruining that necessary East-West cross street so badly that I have to use also underbuilt Kessler to get across. There is now no clear road across the River between Kessler and 86th Streets. That's shameful and embarrassing. This city cannot grow without a decent road system. They really need to build a bridge across the river at 71st St. and create a through route from Meridian to Keystone. The language of this directive from "city officials" sounds much like an ultimatum to us "residents". UN Agenda 21 comes to mind.